The “Walk for Justice” event, held on Saturday, June 4, in Tampa, was a solemn reminder of the consequences of red-light runners and the need for better traffic safety. The car Angelique Cruz and her sister were traveling in was T-boned by a truck that ran a red light, resulting in serious injuries and the death of her unborn child. The driver received only a traffic ticket for the crash. Everyone in Tampa knows that red-light accidents are a major issue, but disagree vastly on how the problem should be handled. “Walk for Justice” is a push for lawmakers to consider running a red light to be reckless driving, making it a misdemeanor crime. Hillsborough County, on the other hand, has invested heavily in a red-light camera solution. Tampa’s red-light camera contract with American Traffic Solutions expired in April 6. An extension is in negotiations, but critics of the red-light cameras want them shut down permanently, saying the red-light cameras are little more than a revenue-generating measure and do little to provide safety. Worse yet, some critics point to statistics showing that intersection crashes where red-light cameras are installed increased by nearly 15 percent, posing a traffic hazard while attempting to solve one. 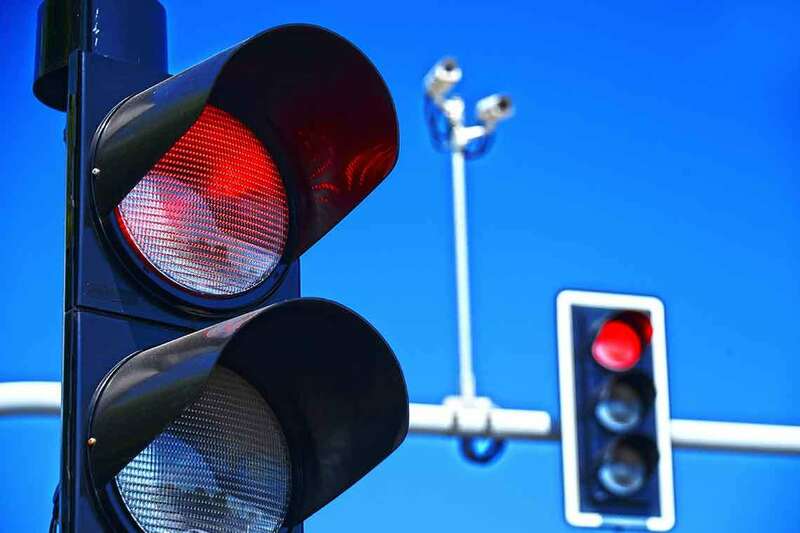 If punitive measures like red-light camera tickets are not preventing instances of red-light running or reducing accidents at intersections with red lights, how can Hillsborough County help protect drivers? Tampa may need to start using alternative methods to make intersections safer. Here are four alternative safety measures that have been proven to reduce accidents around the United States. In 2013, Florida Department of Transportation passed new state guidelines to increase yellow light times, but their yellow time intervals are still shorter than recommended by the Institute of Transportation Engineers. All across the county, cities that have increased yellow-light intervals have seen a drop in drivers running red lights. Short yellow times, especially those associated with red-light cameras, force the driver to do one of two things: slam on their breaks, potentially causing a fender-bender, or a rush to avoid getting caught running a red. By increasing yellow-light times by just a half a second, drivers are empowered to make safe and logical judgements on whether to stop or continue. All-Red Clearance Intervals occur when all lights at an intersection are red – for a certain amount of time. These intervals create a period of time when no cars are given the green light to go, freeing up the intersection of any cars and reducing the potential for a crash, according to the U.S. Department of Transportation Federal Highway Administration. The American Automobile Association has experimented with implementations of All-Red Clearance Intervals in busy cities like Detroit and have found it to be a low-cost solution to rampant red-light running and accidents. Along with implementing all-red clearance intervals, the AAA of Michigan also increased the lens size of traffic lights by 50 percent, and found it to be helpful in the effort to reduce crashes. Larger traffic light lenses allow motorists to be able to see traffic lights more clearly and from farther away, something that is helpful for red lights on higher speed roads. The size of a traffic light is important for determining whether motorists can see traffic signals, but increased lens size will do nothing if the traffic light is visually obstructed. Intersections with frequent red-light running may simply need the traffic lights to be repositioned away from utility wires, trees, and other obstructions. Adding additional signage, such as a “signal ahead” sign, may also help on high speed roads. As locals remember the death of Angelique Cruz’s baby after her tragic red-light accident last year, the Tampa community awaits how the county will address the issue of red-light running. Whether Hillsborough County decides to improve traffic light engineering, invest more heavily in red-light cameras, or change red-light running into a misdemeanor crime, locals believe it is essential for the county to instate measures to better protect motorists and pedestrians. If you’ve been injured in a car accident in Tampa caused by a motorist running a red light, read more about how the attorneys of Morgan & Morgan can help.